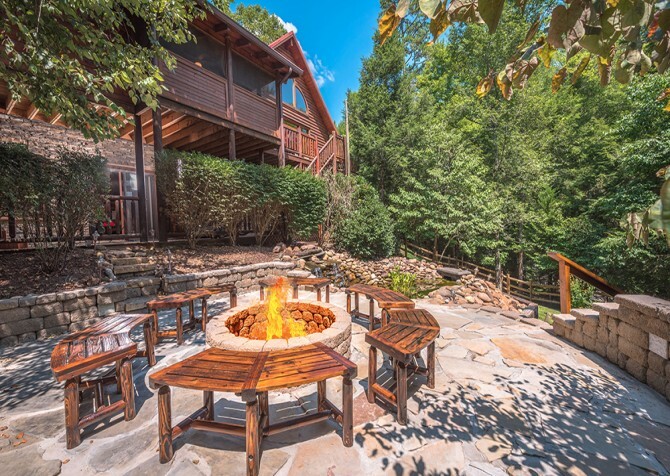 Beautiful mountain and wooded views, 2,400 square feet across 5 decks, stacked stone fireplaces, indoor jetted tubs, games in the rec room, big screen TVs, an outdoor hot tub…the list of entertaining amenities at the semi-private Lookout Lodge goes on and on! 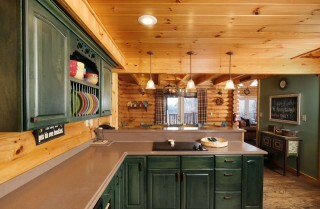 Gather up to 22 of your closest family and friends for a relaxing Smoky Mountain vacation at this 3,345-square-foot large-group cabin set on a ¾ acre of land in Pigeon Forge, decorated with all the bells and whistles and boasting a flatscreen TV in all 4 bedrooms and 6 full bathrooms for comfort and convenience. Throw a barbecue party one evening and host a game tournament the next, treat everyone to your homecooked lasagna with the fully equipped kitchen, make movie night a regular event, and enjoy breakfast on the porch swings with the mountain-fresh air. 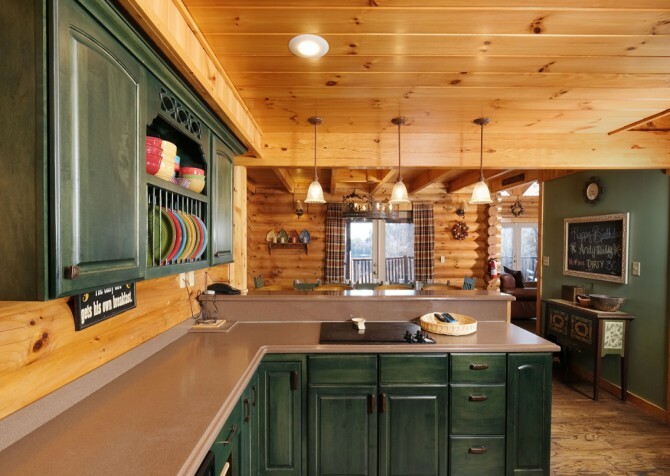 Catering to every large-group need, Lookout Lodge is the perfect cabin for a fun family reunion or leisurely group getaway. Situated in the peaceful neighborhood of On Higher Ground, Lookout Lodge is less than 8 miles from the parkway in Pigeon Forge! It’s easy to pop into town for dinner shows, a great meal, classic Smoky Mountain taffy and fudge, family-friendly attractions, moonshine, and more! Featuring a stacked stone, gas fireplace and a big screen TV, the living room is a great place to unwind with a good book and enjoy lots of room to spread out with the whole gang. And the glass-and-beam windows that stretch 30 feet high make it grand and open! Grandpa relaxes in the recliner and the little ones roughhouse on the area rug, enjoy the gentle sway of the rocking chair or get cozy on the sofa. Better yet, prop up your feet on the love seat with your spouse. Before you get too snug, pass around popcorn bowls and pop a film in the DVD player. It also serves as an extra (comfy) space for guests, with 2 queen sleeper sofas with memory-foam mattresses! Run out of popcorn? Simply head to the microwave in the nearby fully equipped kitchen — complete with stainless-steel appliances — for a refill. Don’t forget to grab a few drinks from the fridge while you’re at it! In the morning, cook breakfast on the island stove or bring out the pancake griddle, rinse fresh fruit as a yogurt topper in the double sink, and put a little pep in everyone’s step by brewing your favorite blend with the Keurig coffeemaker, the French press coffeemaker, or the electric tea kettle! For lunch, set out a sandwich spread with toasted slices, an array of deli cuts, and locally grown vegetables along the island’s bar area for 3. And dinner will be easy with a crockpot in the cabin! When the homemade feast is finished in the evening, pack the provided cookware and dishware into the dishwasher, so effortless cleanup can commence. As if views of nature weren’t enough to inspire good times in the kitchen, a CD player awaits to really get the party started. This fully equipped kitchen with brand-new dishware, pots, pans, glasses, and small electrics in 2018 has it all! Complete with wooded and mountain views, the dining area boasts a large table for 8. Combined with the bar seating for 3 in the kitchen, a breakfast table with 2 benches nearby, seating throughout the living area, and an extra chair just in case, the whole crew can remain connected at mealtimes. 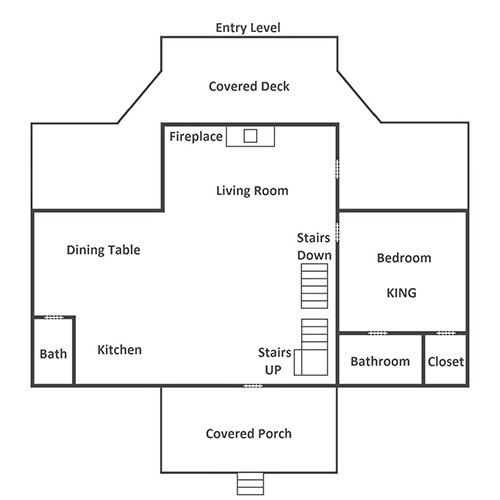 Plus, the open floor plan makes serving dishes and grabbing seconds easy as pie. After the food settles, clear off the tables and bust out your board games and card decks to keep everyone entertained. Forgot to bring your favorite game? Not a problem! The rec space downstairs has plenty to play with: the Multicade arcade unit — featuring multiple classic arcade games — as well as a pool table and a brand-new air hockey table with electronic scoring! And don't forget the board games: Yahtzee, Monopoly, Trouble, Sorry, Jenga, Clue, chess and checkers, Chutes and Ladders, Connect 4, and more! There’s also a small table for 2, great for setting up a drawing and coloring station for the kids. 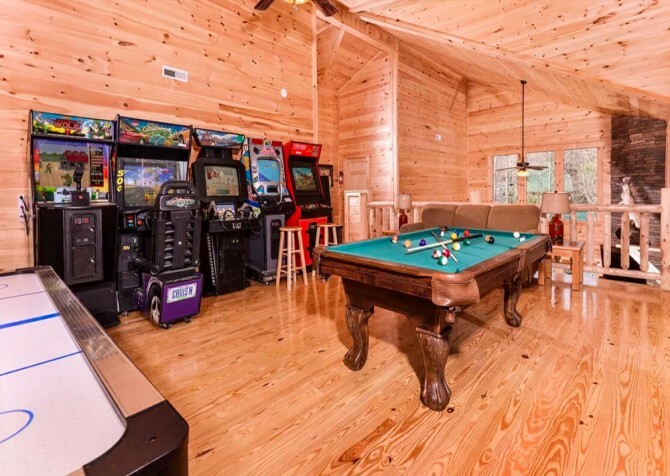 While waiting your turn in the pool tournament, enjoy a classic comedy on the big screen TV or a fantasy novel on the love seat by the stacked stone, gas fireplace. As nighttime approaches, pull out the sleeper sofa, roll out the full bunk’s trundle for the youngsters, and let the teens hit the hay on the twin bunk — a sleeping area in the rec room will be a dream come true for the kids and kids at heart! With 2 queen sleepers (one in the loft), twin and full bunks, a full bunk with a cozy trundle, and 3 king-size beds, up to 22 guests can sleep comfortably at this large-group cabin. Bedrooms are spread across 3 different levels for extra privacy, and each has a king-size bed (with a new mattress) and its own flatscreen TV and DVD player. A few bedrooms even boast direct deck access, bringing the lovely mountain views closer than ever. Also, getting ready to hit the town or to head to bed will be a breeze as there are 6 full bathrooms — 4 with jetted tubs! Make every night a spa night with scented candles, soothing music, and a rejuvenating bath bomb. 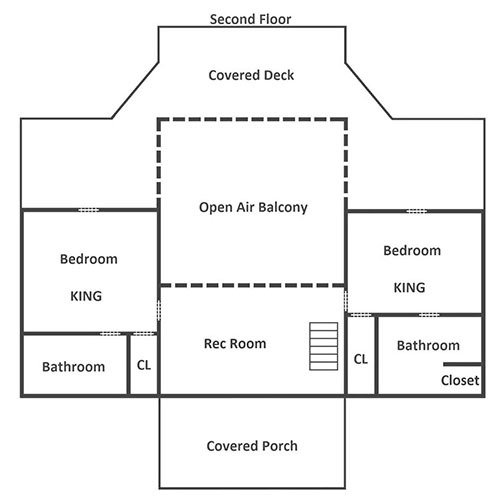 Pull up the flat, paved driveway to your vacation home with parking for 5 and only 6 steps up to the main door. Boasting 4 decks and a front porch, leave your luggage in the cars and head straight for the mountain and tree-studded views with a sway on the porch swings, a rest in the rocking chairs, or a soak in the outdoor hot tub! Before dusk arrives, get a barbecue party started with the charcoal, picnic-style grill — the surrounding mountains will really bring out that Smoky flavor. When the day is done, climb into the hot tub to soothe those tired muscles and let your stresses wash away. After a long hike in the Great Smoky Mountains National Park, toss your laundry into the provided washer and dryer to keep your suitcases fresh for the return home. Need to keep up with emails or Netflix dramas? Take advantage of the complimentary high-speed wireless internet. 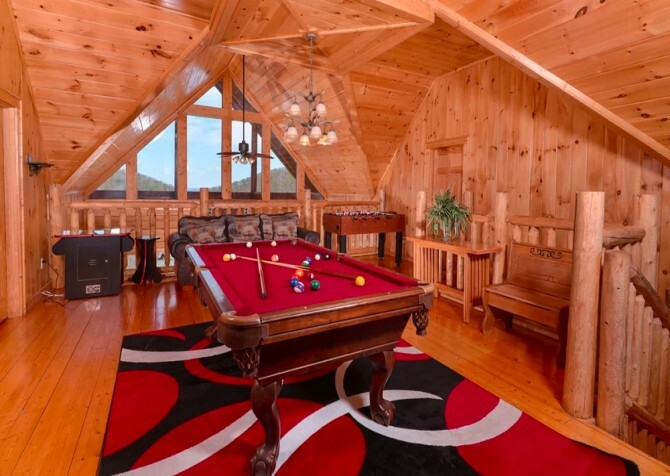 Additionally, this cabin is semi-private, providing personal views of the Smokies. Want a movie night in the cabin? Climb into one of the 10 leather recliners and sit back in front of the projection screen for an awesome theater experience – without leaving the cabin! Just pop some popcorn in the kitchen, grab your favorite candy and drinks, check out the DVD library in the cabin, and enjoy! If you can bear to leave your cozy abode at Lookout Lodge, head to town for outdoor adventures, dinner shows, and shopping galore! It’s time for a top-notch adventure at Smoky Mountain Ziplines — where you can reach speeds up to 25 miles per hour down 7 exciting ziplines through the Smokies. Grab your cowboy hat and boots for an entertaining dinner attraction with horses, clowns, special effects, musical numbers, and more at Dolly Parton’s Stampede! Pick up a few Smoky Mountain souvenirs, sample homemade fudge, and grab a bite to eat at Moonshine Ridge Country Store & Café — a local favorite. "Lookout Lodge is an amazing cabin and was fantastic for our mini family reunion! The three master suites were all perfect with kingsize beds, balconies, and full baths, including jacuzzi tubs. The lowest level was any kid's dream space. We had 5 kids in our…"
"Lookout Lodge is an amazing cabin and was fantastic for our mini family reunion! 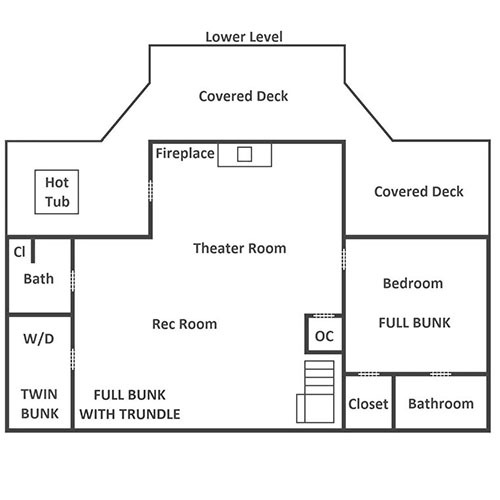 The three master suites were all perfect with kingsize beds, balconies, and full baths, including jacuzzi tubs. The lowest level was any kid's dream space. We had 5 kids in our group, ages 9 yrs-18 yrs, and we never heard a complaint out of any of them. Lots of bunk beds, arcades games, air hockey, and their own movie theater!! Plus they were able to hop in the outdoor hot tub any time they wanted. No one was ready to leave when our week was up. I'm looking forward to planning our next reunion at Lookout Lodge!!" Thank you so much for this awesome review! We are over the moon to hear that your entire group enjoyed Lookout Lodge. From the recreation room to the theater room and hot tubs, it sounds like your next reunion cannot come fast enough! "We recently booked our first ever cabin rental through Cabins For You and could not have been happier! The cabin was a close drive to Pigeon Forge and Gatlinburg but up in the mountains so we all got great sleep and enjoyed the views. There was SO much space and activities for the four kids to do! The cabin was very clean, kitchen well stocked and we had plenty of towels/wash clothes. The keypad made it easy to come and go without worrying about keys. We will definitely be back and had such a wonderful Spring Break!" "I work at a company that provides care for special needs adults, and we wanted to bring some of our individuals to Tennessee. Choosing this cabin was the best choice for our trip. It was conveniently located by all the attractions but secluded enough to enjoy our privacy and mountain views. There was a bedroom and two pull out couches on the main floor for our individuals that had trouble with mobility. There were a few steps to the entrance of the cabin but it was easy enough for the individuals to climb. Majority of our individuals loved the theater room that had plenty of movie options which was located on the bottom floor. And of course, they enjoyed the games that were provided also. We spent a whole day just enjoying the cabin and all the amenities provided that not leaving the cabin was no problem. My supervisor enjoyed creating meals in the spacious kitchen and grill. The hot water lasted enough to bath all 11 of us without running cold. We only brought one 15 passenger van with concerns that there wouldn't be enough parking. To our suprise, we still had room for at least two more vans if needed. We truly enjoyed our stay at the lookout lodge and hope to book with yall in the near future."